In July of 1944 Oberleutnant Otto Carius of s.Pz.Abt 502 in his Tiger tank spearheaded a pell-mell rush into the small Russian village of Malinava in order to rescue an encircled assault gun battalion and stabilize a defensive front in the Dunaburg (modern day Daugavpils, Latvia) sector. What followed in the brief 15 minute encounter is the stuff that legends are made of. 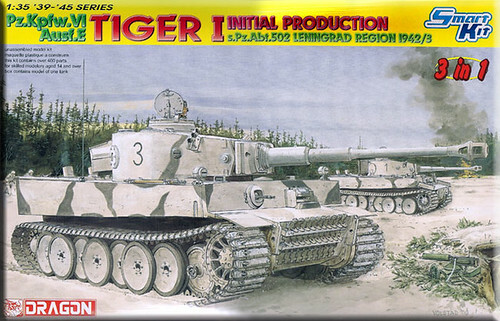 Carius, along with one other Tiger from his company, charged into the village after a quick reconnaissance had pointed out that Russian tanks were present but that they had only just arrived and were not in anything like a good defensive posture. 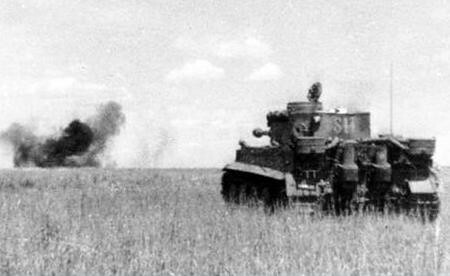 Quickly bringing guns to bear the Carius Tiger and his companion, Feldwebel Kerscher in another Tiger, destroyed 17 of the heavy IS Stalin tanks (Not sure if they were the IS-1 or the IS-2 variety) along with 5 T-34 tanks (probably T-34-85 as they are noted as ‘heavy’ in the after-action report). Because Carius was able to destroy all the tanks in the village before any of them could report the remainder of the Soviet armor was moving forward in route march with no idea of the debacle that had occurred in Malinava. Carius, with 6 of his 8 Tiger tanks now in attendance ambushed the remaining Soviet column destroying an additional 28 tanks and numerous trucks. This action allowed the rescue of the trapped soldiers and stabilized the front line for at least a brief period before the eventual Soviet onslaught. 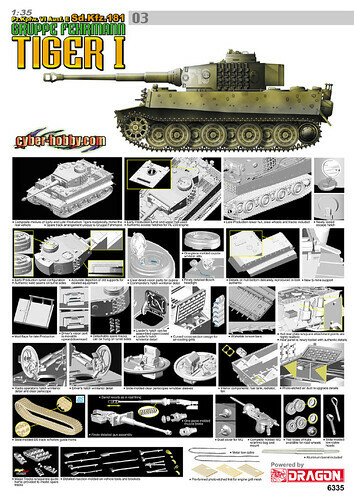 Cyber Hobby has now released a new iteration of the venerable Tiger tank, a replica of the vehicle that took Carius into battle on that July day in 1944. 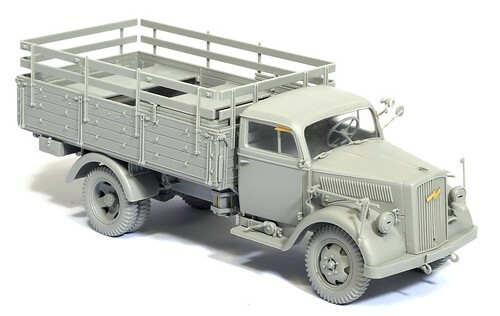 As would be expected with the clear singularity of the vehicle, DML has produced this new version through their limited run Cyber Hobby line which is tailor made for these more esoteric models. You’ll get no smarmy “Not another Tiger” comments from me on this, I, for one, have no problem with another version of the Tiger released through the Cyber Hobby arm, I believe this is exactly what this particular medium was intended for. 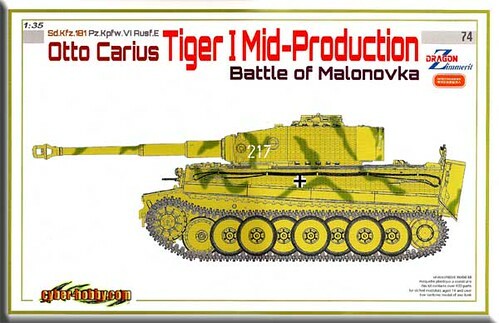 The kit is a white box release as Cyber-Hobby 74, Otto Carius Tiger I Mid-Production Battle of Malonovka (not the common spelling). 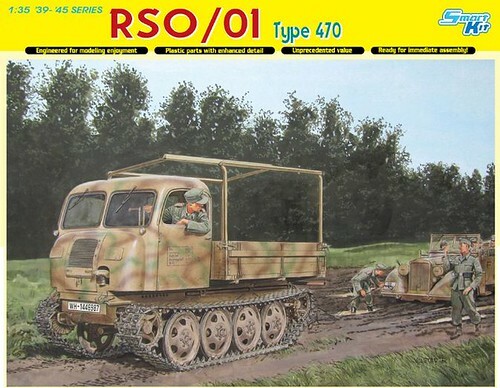 It was originally released as Battle of Narva but apparently Carius was not actually assigned this vehicle at Narva so a slight change from the early advertisements and banners, some of which can still be found, although I don’t believe you will find any boxes actually labeled thus (could be a collector’s item if any of them were actually released). I will confess early on that I know some things about the Tiger but am in no sense a Tiger expert, notwithstanding I will do my best to point out what I see in the box both good and bad. The kit comes packaged in the standard Dragon/Cyber-Hobby large slip cover box and is packed to the gills with a full array of all the precision molding we have come to expect. The Dragon card is right on top with the small decal sheet, two lengths of twisted wire for the tow cables and the track cable, a single photo-etched fret, two small clear sprues, and the individually packaged commander’s cupola. You also will note the small black plastic tray with the four pre-cut engine screens, the pre-formed shovel holder and wiring for the single headlight, and a spring for your action recoil! Finally, the last of the goodies, the DS track which is packaged carefully in a shallow tray molded in two long, single lengths. The instructions are a standard Dragon style 8-panel foldout with a parts map, painting and marking guide, and 20 steps to guide you through the build. Of course you also get no less than thirty-five individually lettered sprues all in Dragon’s familiar light gray plastic in various sizes. Along with these sprues come another three parts; hull, turret shell, and commander’s cupola, that are not attached to any sprue at all. As a consequence of Dragon’s policy of multiple use molding for families of vehicles you will also end up with a raft full of leftover parts, not quite a whole Tiger tank but if you keep shoveling who knows what may show up at the bottom of your pile. The quality and fidelity of the molded parts is absolutely state of the art, slide molded with no flash, mold shift, or visible knock out pin marks evident anywhere throughout the kit. Starting from the bottom up, the tracks as mentioned earlier, are the glueable DS type which makes life a whole lot easier. I know some folks don’t like them much but I don’t see much drawback as you can glue down the top run to create the signature sag of the Tiger. The tracks are the flat style without any ‘cleat’ or tooth on the contact surface, a style that was particular to Carius’ Tiger during this encounter and changed out soon afterwards. The tracks have very nice definition around the track pin and the track guide horns are correctly hollowed out. The suspension is the individual torsion bar type that Dragon has used for some time now allowing some articulation of the finished model. The wheels are the rubber rimmed variety and are chock full of the tiniest details, slightly raised numbers to ensure placement in the proper station on the rear face, delicate weld beading, the ‘Fulda’ and size embossing on the rubber rims, and great hub detail. Also, the modeler can leave some of the outer wheel assemblies of, as was often seen on operational Tigers, with an exposed hub as Dragon has included the hubs and photo-etch parts to replicate the delicate detail therein. The drive sprockets are the later version and look great, the rear idler is the well detailed and comes on the cam style axle that can be turned to tension the tracks correctly; take care that you don’t inadvertently glue it in place before the final installation of the tracks (personally, I would wait until the very end after painting). Finally, Dragon has included two extra wheels with separate rubber tires meant to represent the oft damaged wheels giving the modeler an opportunity to add them for a more realistic appearance. The hull is a one piece slide molded affair that offers nice detail, the bump stops are molded on (thank you, I don’t need every little thing as a separate part), the reinforcing strips look good, and the bottom of the hull shows off some delicate weld bead work and well done access plates and drain plugs. The hull is finished off with the addition of a lower front plate with the zimmerit already molded on and the two part final drive covers. The hull rear plate is new for this kit due to the molded on zimmerit which looks very, very well done. Thankfully, the plate is free of the zimmerit at the attachment points for the separate parts, something that has not always been the case. The mufflers are well done and have the requisite armored covers and heat shrouds included. The engine crank, mud flaps, tail light assembly, starter cover, towing clevis and retaining brackets are all well represented as is the sweet seven part jack. Finally, the rear plate has the attachment brackets for the external travel lock which is very well done consisting of multiple parts that can be modeled in one of three configurations; open in the non-deployed state, closed without the gun in place, or finally, with the gun in place for travel mode. Moving inside to the engine compartment Cyber Hobby gives you the engine cooling fans, radiator, and fuel tank assemblies underneath the engine cooling grates. These have all been seen on numerous earlier Dragon Tiger releases but that doesn’t take away from how well done they are; much nicer than blanking it off with a piece of black painted plastic card! Heading topside we have the two part engine grates topped with the pre-formed PE engine screens for a very nice look. 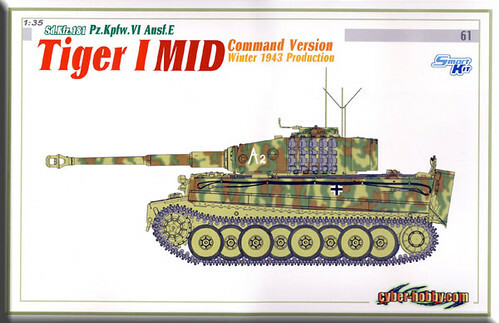 The remainder of the engine deck is much the same as prior Tiger I E mid and late versions. You have a choice between the plastic molded tow cables or the wire cable with plastic end loops that have the ends hollowed out for easy insertion of the metal wire if you take that route. Tools come in two varieties as well, you can opt for the tools with clasps molded in place all in plastic or you have a set of clean tools for which you can build up clasps from the included PE, your choice. The PE does give better definition but the all plastic isn’t bad at all and makes the construction move along quicker. Dragon does provide the PE forming guide on the sprue to make things a bit easier if you don’t have a PE folding tool. The fire extinguisher is first-rate but the instructions call out for the instruction placard decal; however the decal sheet doesn’t include it, a real downer as it is in such a prominent location and one that someone at Dragon should have caught. The rest of the rear deck is very well done with well rendered subtle detail that is state of the art molding at its best. Moving forward of the turret you have a few more pieces of equipment that are all molded as separate pieces, brackets to hold the tow cables, tow shackles, crew hatches, and ventilator cover. The cover has a nice cast texture and the crew hatches are first rate, the rest of the on board equipment, again with the choice of PE or molded on plastic clasps. You also get the standard Dragon jack block, meaning it looks great with good wood texture on the top only with no texture for the sides (arghh!). Moving forward you have the very nice center mounted Bosch headlight and the hull machine gun. While this is not the first time we have seen this MG it is so nice it deserves mention, one of the nicest around, and you get not one, but two, so you can mount the AA MG for a different look. The driver’s vision block is very nice and is able to be left operational if you are careful with the glue. Sliding downward we hit the upper glacis plate which is one of the new parts for this particular kit. The glacis has the zimmerit already molded in place and is some of the nicest zimmerit texture I have ever seen bar none. The hull sides are new pieces that are added to the hull tub, they sport the new zimmerit with the locating lugs for the skirts in place. The skirts are the same affair that we have seen in previous Tiger kits, one long length for each side with nicely thinned edges. Jumping up to the turret and the business end of the tank we see a 7 part slide molded gun assembly from the gun sleeve forward. The turret itself is a slide molded affair with the zimmerit molded on. The zimmerit finish on the turret is a bit different than the zimmerit finish on the other pieces, not quite as subtle as the hull or mantlet, so it may be a turret shell from a previous Tiger, not really sure one way or the other. The rest of the turret is superb, loader’s and commander’s hatch are superlative; both highly detailed inside and out with the option to be opened or closed. Ventilator cover comes in two flavors; deep wading or the more standard cover. Inside you have decent detail to include two nice seats and a nominally complete gun breech. The turret sides have the option to hang some very nice spare tracks on them; these are done in regular plastic (non-DS) with separately molded guide horns. The turret escape hatch has been redone and can be positioned open or closed with detail on both sides. 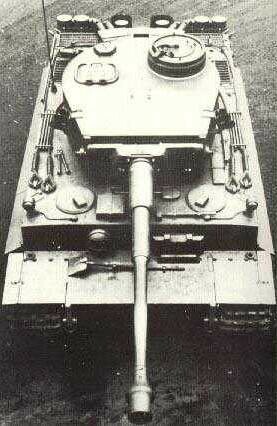 The mantlet is new as well, and is of a style that is specific to Carius’ Tiger with a flat face and binocular sight and co-axial MG opening and a small notch cut from the bottom left corner. The turret is finished off with the very nice rear turret bin with the option of adding the very nice PE latch and lock. The paining and marking guide is somewhat limited as would be expected with a specific tank keyed to a particular individual. You get the option for Carius’ mount in the Malinava firefight in July of 1944 or what seems to be the same tank from earlier in the year during the Narva offensive, but before it was assigned to Carius himself. At any rate, the markings are a bit minimal; simple balkenkruez markings for the hull sides and the vehicle’s number 217 markings for the turret sides and rear. The vehicle did not carry the mammoth symbol or any other tactical markings for the 502 s. Pz. Abt. I would guess this will be well received as it fills a nice niche in the history of the evolution of the Tiger and the Otto Carius connection just makes it a double winner. The new pieces with the zimmerit molded on are very nice; I’ll stick my neck out and even say that I think they are a bit nicer than much of the aftermarket zimmerit that I have seen. With this being a Cyber-Hobby release this kit will probably disappear quickly after which the E-bay prices will rise to a point that most of us will wish we had two of these in our closet; one to build and one to trade. My best advice would be to grab one while you can. 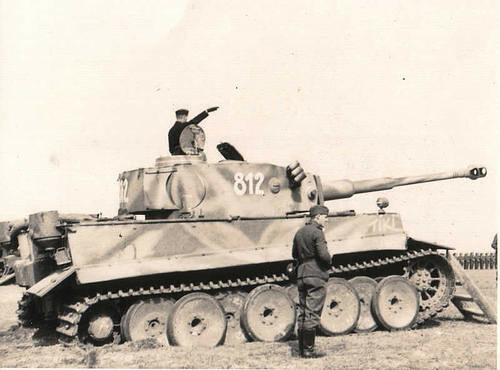 Highs: A new state of the art Tiger; the personal mount of one of the most decorated German tankers of the war. Superlative zimmerit texture throughout, new wheels and hubs, DS tracks, choice of molded on or PE tool clamps. Bottom line; a very, very nice kit. Lows: Not many; missing decal for the fire extinguisher, may be missing a cutout on the front towing shackle attachment. Verdict: Highly recommended, go get one before they are all gone because they will go fast. Don't get me wrong guys, but what is drastically different with this release? 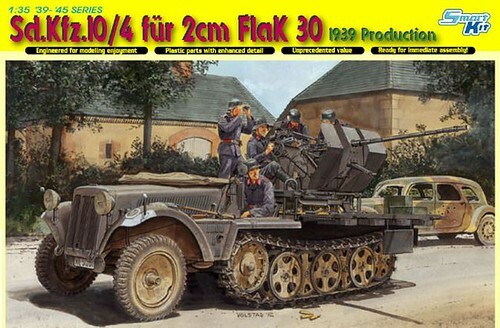 Between their initial and late '39-'45 series and white box kits (not counting the DAK kit, that is too mythical a status now), we have: -Rubber and steel roadwheels -early and late copula's -early and late gun mantles -some different roof options What we don't have: - S.mine launchers - Feifel air cleaners (both) I know there are countless other features I am missing, but these are the big ones that stick out in my mind. 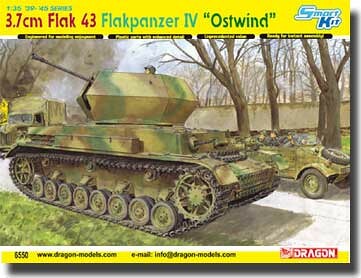 That said, let's look at the white box history of tigers (not counting the DAK kit): In all of these releases, we never get the s.mines or Feifel air cleaners. Why? 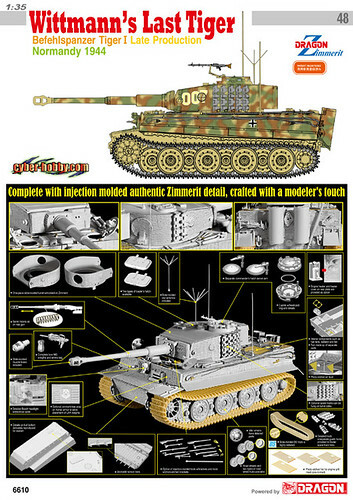 I feel like an eager modeller who can apply their own zimmerit could achieve most if not all of the white box releases with the following '39-'45 kits: I know that there would be some features missing (ie: gun travel lock), but the bulk of the parts are already there. It seems to me DML has been mix matching the above two kits for the past 5 white box releases with adding a small sprue and or molded-in-zimmerit. 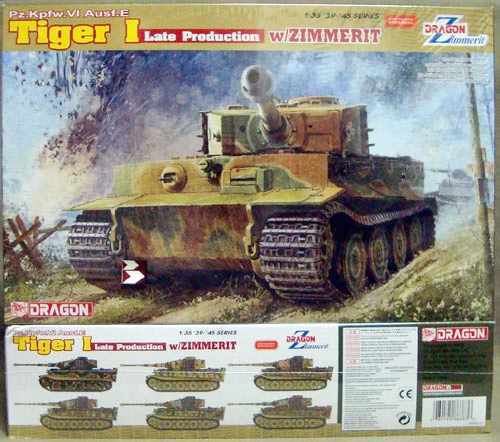 What a killing DML would make if they released a '39-'45 kit with the following features: I know I probably sound a little bitter, but I get the sense that they are creating all of this craze whenever a new tiger is released as a white box kit. 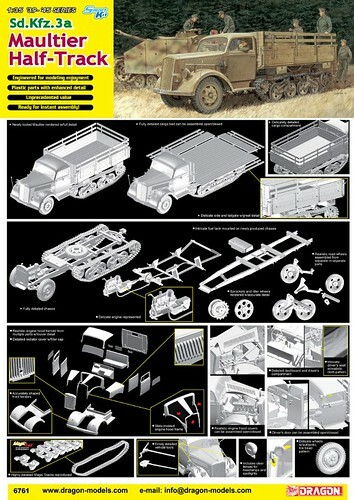 The part I am stumped on is it doesn't really seem like we are getting anything new, we are just paying a really high price for sprues we have seen before still without indy-link tracks. BTW, I know DML doesn't owe me anything. If they want to release 20 other late white box tigers, they can do whatever they want! They certainly sell well for the company, and at the end of the day they are not here to please me. For those that bought this Otto Carius release, I am sure you will love it! It is an amazing kit at what it does, that I cannot deny . Just because I, or someone else says they don't like it, doesn't mean it isn't a really cool release. 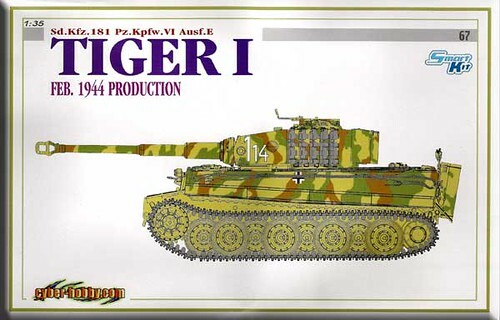 For now, the Tamiya release will have to serve the "early-mid" tiger market. Thankfully the kit is pretty good. 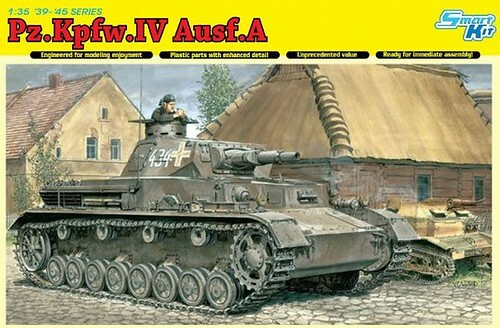 That said, DML has come out with some really nice kits for the German fans out there. Not all other their releases have been similar to the white box series of tigers: While DML's entire release spectrum may not feel as fresh as Bronco or ICM's recent offerings in WW2 German armour, I can't write off all of their stuff as boring. Thanks for the review Rick, I don't mean to hijack the thread with my rant. If there is too much discussion on this instead of your excellent review, I will move this reply to a separate post. Oops, I did miss that one. I know everybody talks about the DAK tiger, but that one to me would trump all of them. Thanks David. 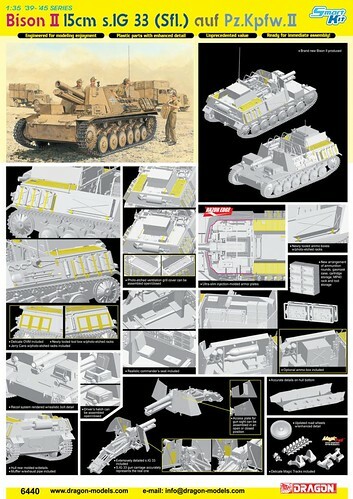 David,Ive been meaning to ask you, whats a good reference for 1/35 scale drawings for the DAK Tiger? any that show the early filters? Thanks for that information, I just wish Dragon USA would stop advertising this kit as it's OOP.